The athletics program at IMS reflects the school’s valued traditions of fair play, cooperation, sportsmanship, and love of the game. Talented and motivated coaches work closely with each student to enhance the educational experience and improve self-discipline, respect, communication skills, and collaboration. All students participate in athletics throughout the year, choosing from a variety of teams and competitive levels, and enjoying an extensive range of athletic and recreational facilities. IMS faculty get to know their students and their strengths on a deeper level by serving as their coaches and mentors as well as their teachers. Being a student athlete at IMS is an integral part of the creativity, energy, and growth that enables each child to flourish at IMS and beyond. Visit the Lower School section to learn more about physical education and sports in our younger grades. The Falcons are off to a strong start as the spring season begins ramping up! The winter sports season has officially wrapped, and student athletes were honored during our recent sports awards. Max has been an avid participant in sports throughout his life including three seasons throughout elementary, middle, and high school. 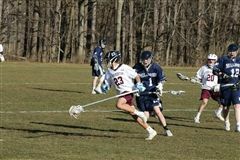 While attending Springfield College, Max studied athletic training, was a resident assistant, and a four year member of the men’s lacrosse team. Max has clinical experiences with college football, field hockey, basketball, and soccer and high school hockey and wrestling. Max is a member of the National Athletic Trainers’ Association and a Certified Athletic Trainer (ATC) through the Board of Certification. Max is a native of New Hampshire and is familiar with the private school experience as a graduate of Kimball Union Academy. An exuberant outdoors man, Max enjoys hiking, running, mountain biking, Nordic skiing, and any activity that involves being outside.